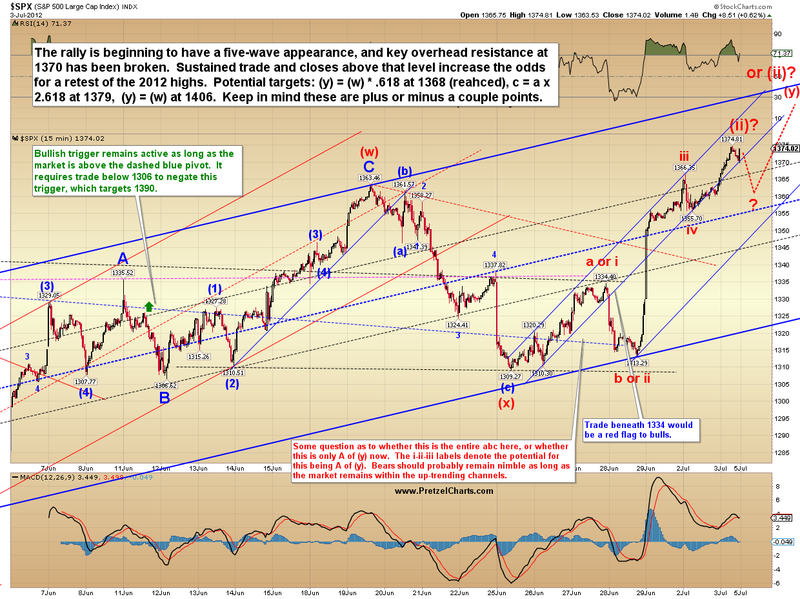 SPX and Euro Updates: Stop with the Kicking! SPX and Euro Updates: Hey... THOSE Aren't Pillows! So we'll just have to go without. The rally continued into the fourth of July holiday, marking its 3rd straight day of gains... which brings an interesting historical fact to bear: Going back to 1965, the market has risen 3 consecutive days prior to July 4th on 9 previous occasions. In 8 of those 9 instances, the next trading day closed in the negative. That historical precedent, coupled with the fact that the McClellan Oscillator (NYMO) (which, as I mentioned on Monday and Tuesday, is extremely overbought), suggests a pullback is due. 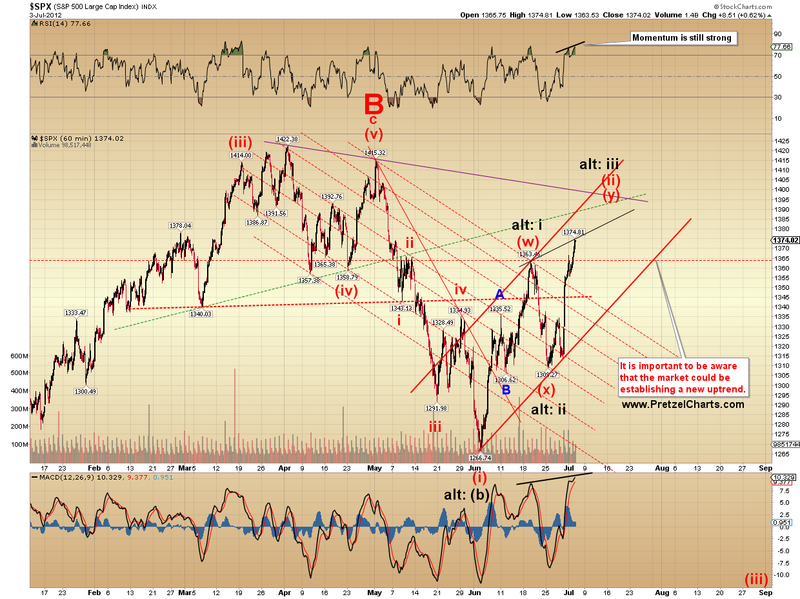 However, the odds now favor a continuation of the rally after the pullback. The up momentum has been strong, as measured by RSI readings (chart later) and the advance/decline line (not shown). Normally, after such a strong thrust upwards, there is some residual momentum that carries the market up to new highs after the first pull-back. 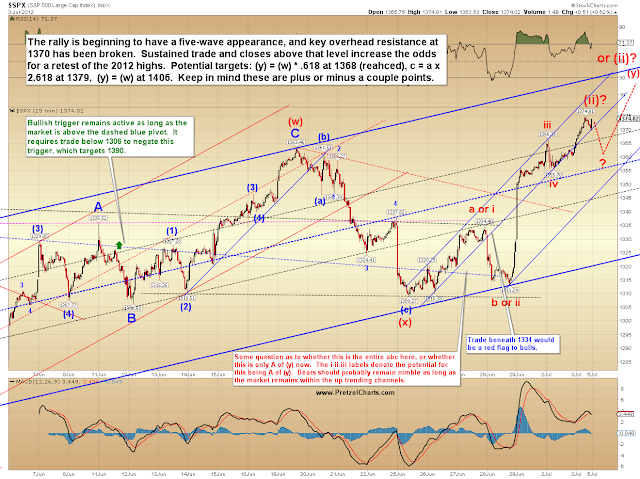 Further, the market was able to break and close above the 2011 high of 1370. Granted, this came on a light holiday session -- so we'll see how the market behaves afterwards. The wave could be counted as complete, hence the (ii)? label at the 1374 high. These types of waves are tough to count, though, and I'm hesitant to suggest a top here, based on the info currently in the charts. So... barring an immediate and strong reversal, the odds are starting to favor the higher target of 1406 being reached and possibly even breached. The more bearish big picture count remains favored for the time being, but there's simply not much for bears to get excited about at the moment -- and this is the type of rally I would suggest not be front-run by inexperienced traders. If you know where to jump in and out, and are good with your stops, then by all means, have at it. But if you're someone who has a hard time letting go of a losing trade, and/or a hard time protecting profits, this might not be the type of rally to try learning the ropes trading counter to the current trend (which is up, in case you've missed the up-sloping channels drawn on the charts for the past several sessions). Note the RSI (top panel) on the chart below, which made a new high along with the recent price high at 1374. This suggests that momentum is still strong, which suggests that the final high isn't in yet. This doesn't always work, but it works the majority of the time. 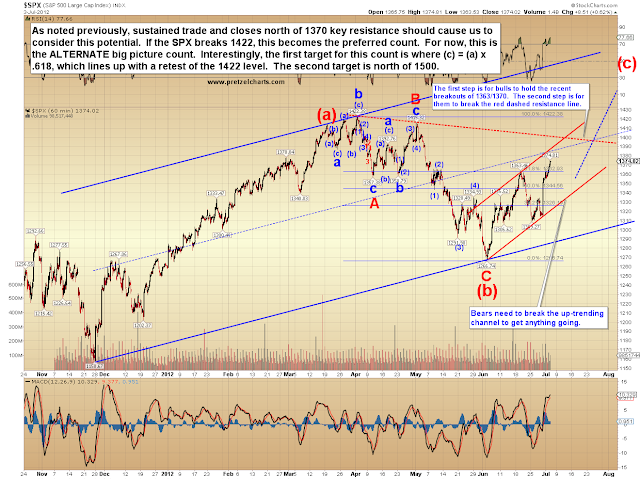 In keeping with my promise to consider the more bullish potentials if 1370 was broken, the next chart shows the big picture bullish count. This count remains the alternate for the time being, but as I've stated in the chart annotations for several days, bears need to be on the defensive as long as the market remains within the uptrending channel. For traders who would rather short things than go long, perhaps one should consider switching to the euro/us dollar currency pair. The euro has been in a solid down-trend for a long time, and has now back-tested a massive head and shoulders formation that projects a target south of 1.10. This target is active as long as the euro remains beneath the lower trendline. Long-time readers will recall I suggested the euro as a possible short candidate on April 29. As yet, I see no reason to cover those shorts. 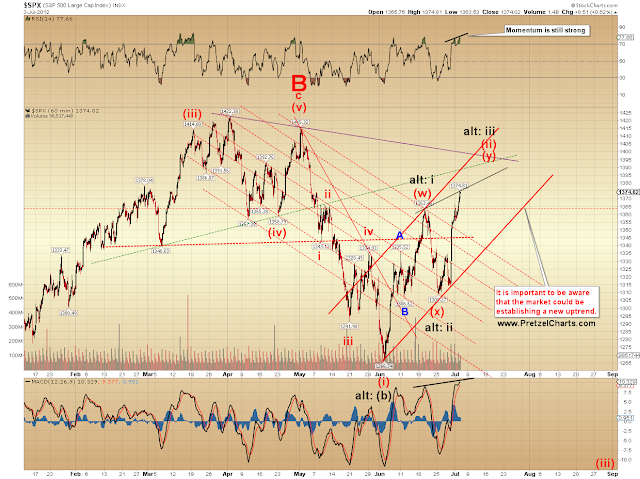 One can see that since Spring-2011, this has been a much more consistently solid short opportunity. (Zecco Forex, one of my sponsors, offers quick and easy account setups and funding via credit card -- please use my link if you sign up. Many thanks! This is not trading advice.). In conclusion, the short-term trend remains up for the time being; the intermediate down-trend has been broken and is now neutral (the bulls still have some work to do to change it from neutral into an intermediate up-trend), and the long-term trend is still up. Despite these obvious facts, for the time being, I still favor the view that this is Minor Wave (ii) and that it will peak shy of the 2012 highs. That outlook is subject to change with changing market conditions, of course. In the meantime, the odds favor a pullback on Thursday (8 out of 9 instances is pretty solid odds -- but please remember that I don't create the odds and historical facts, I just report 'em -- so if they fail this time, don't blame the messenger!) and possibly into the next few sessions, and then a continuation of the short-term uptrend -- again, barring an immediate and strong reversal. Trade safe. I see 1375 as the top of (minuette?) wave 3 of C with wave 4 in progress and a five (subminuette?) waves up to complete 5 up somewhere above 1400 from the beginning of the C wave at 1313... still not seeing the bull takes the reins to 1500 but thx for the alt count -- I know that this could go the other way... as someone once sang "all he believes are his eyes, and his eyes they just tell him lies..."